2 personnes, 1 chambre, grande terrasse + barbecue, baignoire avec vue! Salle de bains 1 dispose d'une baignoire avec vue sur Trèves! IMPORTANT! La ville de Trèves s'élève de 01. Janvier 2018 une taxe supplémentaire (taxe de ville) sur initiative privée, les nuits payantes. nuits professionnelles et des voyages à des fins éducatives sont exonérés de la taxe de séjour. Introduit La taxe de séjour est de 3,5% du tarif de la chambre par personne / nuit - jusqu'à 7 nuits de votre séjour. Cette taxe d'hébergement sera facturé séparément au client - est pas inclus dans le loyer. Prachtig penthouse. Mooi en gezellig ingericht. Compleet huishouden. Ausgezeichnet. Ruhige Lage und sehr bequem. Die Wohnung ist schön eingerichtet und gut ausgestattet. Although we stayed only 3 nights, we have enjoyed the time throughout. Money well spent. In dieser Wohnung den Urlaub zu verbringen ist ein Hochgenuss. Die gesamte Einrichtung ließ keine Wünsche offen. Sehr angetan waren wir von der absoluten Sauberkeit. Blumen und Obst zur Begrüßung haben uns sehr erfreut. Besonders hervorheben muß man auch die Freundlichkeit und Hilfsbereitschaft der Familie Wagner. Wir können dieses Objekt bedenkenlos weiterempfehlen. A lot of consideration went into this third-floor apartment. Claudia Wagner, the landlord, has carefully thought about her renters’ needs. She provides almost everything I have in my kitchen at home — including coffee, cream, EVOO, several types of vinegar, several spices, parchment paper, foil, plastic wrap and bags, a citrus juicer, a scale, plenty of pans and baking dishes, an electric kettle, a Krups pod cofffee maker with an assortment of pods, an automatic drip coffee maker, a dishwasher, etc., etc., etc. Only a microwave oven is missing. If you can’t find something, keep looking. We arrived on Whitsun and learned that the grocery stores would also be closed on Whit Monday. Claudia had provided a large tray of fruit and we discovered the local Esso had grocery and dairy products and an excellent bakery but no fresh produce. Claudia includes fresh flowers, living plants, and lots of candles in the decor. Many of the windows have automatic blinds, some controlled from a sophisticated panel by the front door that also offers weather information such as outside wind speed, temperature, sun intensity, etc. The deck outside is a great place to watch the sun set with a glass of wine. There is both a powder room and a bathroom with your choice of a doorless shower or a Villeroy & Boch tub. Unlike many rentals in Europe, a box of Kleenex is provided along with bath gel and Q-tips. The bedroom has plenty of storage and an abundance of wooden clothes hangers. The hall closet has another storage unit, a safe, more clothes hangers, and two shoe horns. The laundry in the basement includes a washer and dryer and detergent is provided. The abundance of windows throughout the building heats the apartment and the stairwell area. Fortunately, the apartment has an AC that we only needed for a couple of hours in the afternoon when we visited in May. The heat may be a larger issue later in the summer. A free covered parking spot is provided. The neighborhood is quiet, even though there is a rail line about 250 ft. away. You will only see and hear the trains while you’re on the deck and since they are electrified trains, the sound is not loud. Claudia’s office is on the first floor, which makes it easy to stop in for more dishwasher tabs. Be sure to stop by the Schönstattkapelle garden next door. It’s a lovely place to take a break from being a tourist and relax for awhile under the ancient sequoia, beech, and maple trees. Modern und liebevoll eingerichtete Wohnung. Super nette Vermieter. Tolle Dachterrasse !!! Kleiner Tipp: Fahrräder mitnehmen, lohnt sich!!! Notre appartement 'Penthouse Southtown la maison »est la meilleure alternative à hospitalité de première classe! 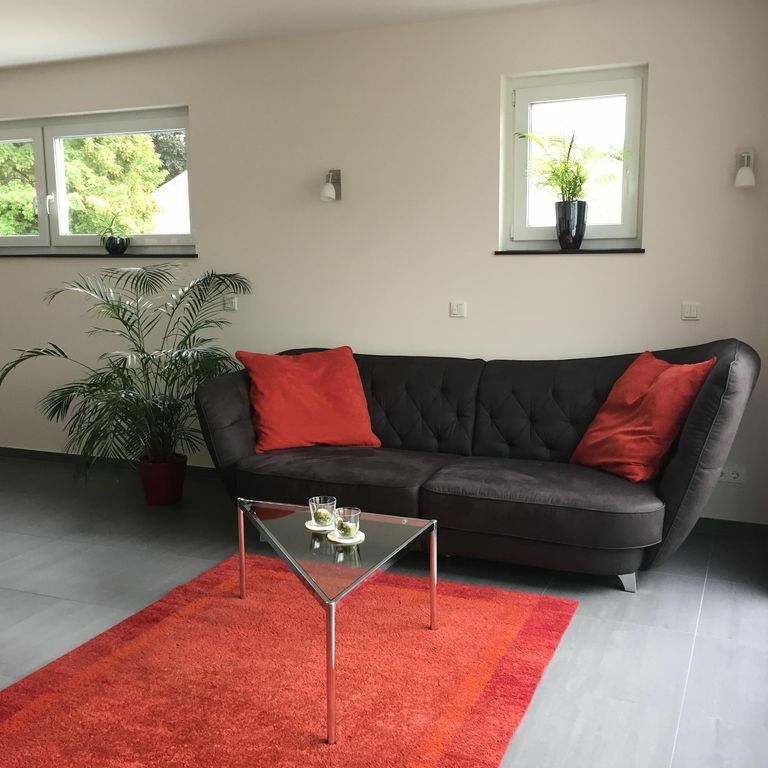 Profitez du luxe d'un appartement meublé de haute qualité et doit renoncer à tout confort. Vous vivez calme et central situé dans un équipement moderne, de haute qualité. Notre conception vous convaincra! Nous sommes impatients de vous rencontrer! Die vorgenannten Preise sind für den Aufenthalt von 2 Personen berechnet. Mindestaufenthalt 3 Nächte für 330,- Euro. Bei Anreise an einem Sonn- oder Feiertag berechnen wir einen Aufpreis von 30,- Euro. Angebote in der Nebensaison - fragen Sie einfach nach. Weitere Preise (für Langzeitmieter) nach Absprache! Haustiere nicht erwünscht! Die ab dem Jahr 2018 eingeführte Bettensteuer wird Ihnen separat in Rechnung gestellt und ist gesondert an den Vermieter zu entrichten.